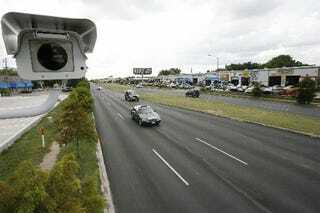 What Do You Think of Red Light Cameras? Recently my friend Brian got a letter in the mail. It said Dear Chuck D. We're suckers. Sincerely, the Government that he ran a red light and the city of Los Angeles needs $371 from him. What are the opposites of happy, calm and peaceful? Stompin', honkin', homicidally angry? That's my friend. I know the justification behind the bilking is safety, but having a whole city populated with pissed off angry people, well, that can't be good for safety. Also, an amphibious mammal, within city limits, that's not legal either. My point is, as I'm actually biting my tongue here and not saying how I really feel about red light cams (think Kinison talking about marriage), I invite all of you to not hold back. Well?